The SANOPAN brand is heir to a long DE SUTTER family tradition. From the onset, technical efficiency and a constant will to improve and innovate have contributed to the factory’s development. The site and machines are being constantly adjusted to the market. The technical workshop’s flexibility helps to bring clients global solutions, which are adapted to their needs. With the client’s help, the SANOPAN Research and Development department can even modify production lines in order to create a customised manufacturing process. SANOPAN’s primary objective is always to improve its customer service. Originating from Belgium, a region where flax has been cultivated for centuries, the DE SUTTER family took the decision in the sixties to use their knowledge of this fibre to recycle “shives” (flax waste). That is how the DE SUTTER Frères limited company came into being in the Haute Normandie region in 1963. An excellent heat insulator and soundproofing material, the SANOPAN board has notably been used to manufacture the doors of the STADE DE FRANCE, the new EUROPEAN PARLIAMENT in Luxemburg and the French MINISTRY OF FINANCE at Bercy. SANOPAN is the only flax board made in France and available on the world market. Other than the product’s physical and mechanical qualities (link with the “flax board” page), its manufacturing process is very much part of a sustainable development ethos. Indeed, SANOPAN is made with 100% natural raw materials and is entirely recyclable. According to ecological reports, flax seems to be on average 50 times more environmentally friendly than other fibres. In addition, during the sorting stage of the production process (link with “the manufacturing process” page), the flax seeds are collected for being sent to oil factories and anything that cannot be directly recycled is used as fuel during the fibre drying stage. The diversity of the SANOPAN product range has been made possible thanks to the technical workshop that is capable of adapting its machines to the client’s needs. SANOPAN offers an entirely customisable industrial process. 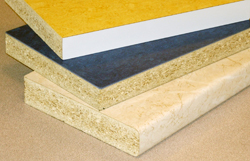 The flax board SANOPAN fully meets E1 standard specifications. This certification is obtained following a lengthy testing process. Details of our accreditation can be obtained on request.